This educational professional recently graduated college with a bachelor’s degree in Child Study and experience as a student teacher and observer. With the necessary experience in place, along with some professional, paid experience in daycare, the resume was formulated to showcase areas of specialty with children with special needs and inclusion classrooms. 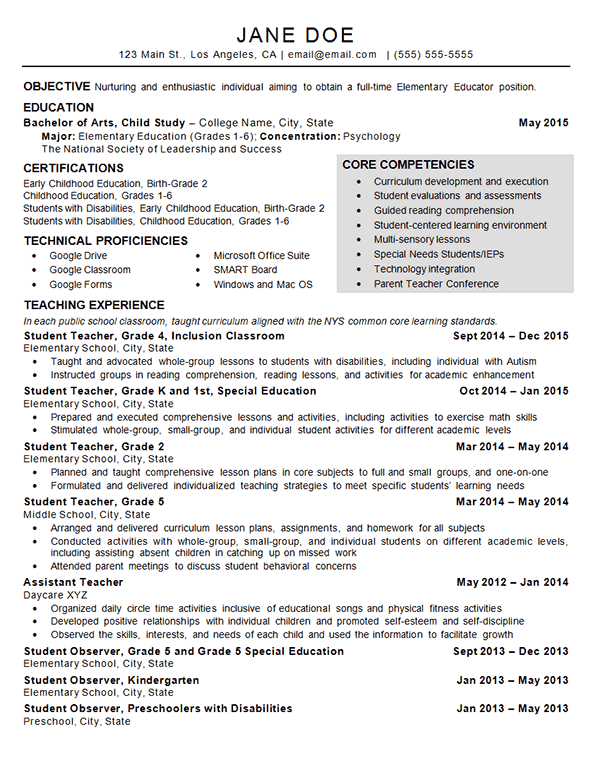 In order to keep the resume to one page, which is very important for an entry-level professional, keywords were used in a Core Competencies section to highlight learned skills necessary to obtain a full-time teaching position. A brief Objective was used to express relevant qualities that would not be expressed elsewhere on the resume. The main challenge was containing the resume to one page and including relevant and impressive responsibilities held within each classroom the candidate worked in, to show their well-roundedness. The template is simple and easy to read for resume scanners and humans alike. Taught and advocated whole-group lessons to students with disabilities. Instructed groups in reading comprehension, reading lessons, and activities for academic enhancement. Prepared and executed comprehensive lessons and activities, including activities to exercise math skills. Stimulated whole-group, small-group, and individual student activities for different academic levels. Planned and taught comprehensive lesson plans in core subjects to full and small groups, and one-on-one. Formulated and delivered individualized teaching strategies to meet specific students’ learning needs. Arranged and delivered curriculum lesson plans, assignments, and homework for all subjects. Conducted activities with whole-group, small-group, and individual students on different academic levels. Attended parent meetings to discuss student behavioral concerns. Organized daily circle time activities inclusive of educational songs and physical fitness activities. Developed positive relationships with individual children and promoted self-esteem and self-discipline. Observed the skills, interests, and needs of each child and used the information to facilitate growth.